I was holding PETS from last week. That rolled over and stopped me out for a full 1R loss on Wednesday. I also tried long trades in DLB, PRGS and MSCC... all of which ended up between a 1R loss and break-even. I got pretty aggressive with my trailing stops on Wednesday because it was feeling WRONG to be long. 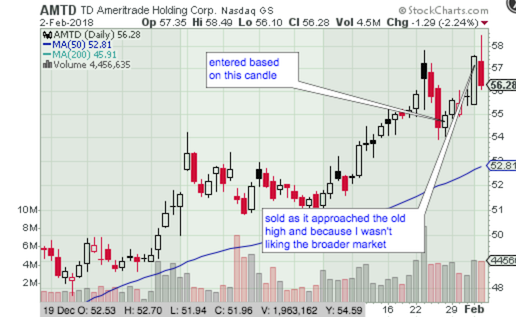 One long setup that worked for me this week was AMTD. 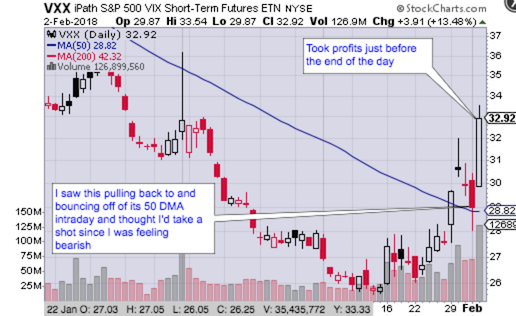 I liked its action on the Friday, the 26th -- it made a (surprise) Calm After Storm as well as a 1,2,3 Pullback. I sold it yesterday near the high of Jan 23rd, which was my initial target. 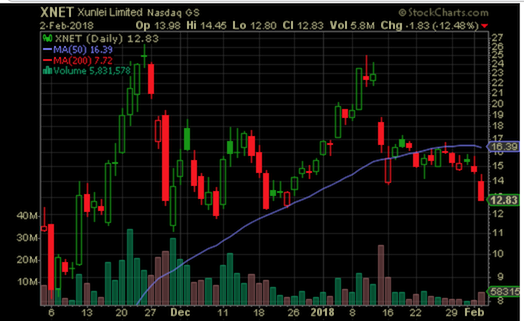 In a stronger market I would have just moved my stop up a bit to lock in a tiny profit but given how the market was acting I decided to take the money and run. The 1.7R gain helped to offset some of the losses from the trades listed above. I'd been feeling nervous about the market all this year. I *really* wanted to be short but I wasn't gonna try too hard to fight the tape. But I'd been keeping some prime shorting candidates on my watchlists just in case things started to turn. So here are some trades which turned my week from red to green (black?). I've mentioned XNET before. It's one of my favorite Bitcoin / Cryptocurrency plays. Or maybe I should say anti-plays, since all I've ever done is short it. Note the break of and failed retest of the 50-day moving average on the daily chart. It also had a nice set of bearish alerts last Friday: Non-ADX 1,2,3,4 Bearish, Shooting Star Candlestick and 50 DMA Resistance. It was stubborn for a few hours, going into Thursday morning but it subsequently fell nicely. I covered in early afternoon Friday for about a 1.5R gain. Another one of my go-to Bitcoin (anti) proxies is LFIN. I've actually traded this one both long and short in the past. I wish I'd entered this on on Wednesday in order to capture the gap down on Thursday. I tried to short in pre-market Thursday but I had no luck getting filled. So I waited until shortly after noon and sold it at $37. I covered this the same time I covered XNET for another 2R gain. The last one was AAPL. Another one which I always keep an eye on. It reported earnings last night and, of course, was "In Play" this morning. I saw that it got a couple of analyst downgrades this morning but was still hanging tough in the pre-market. 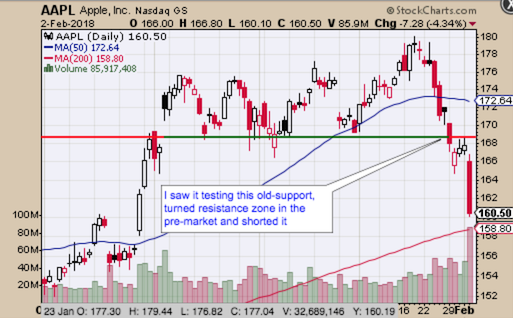 I figured it woudn't be able to make it back above that old support/resistance line & shorted it at $167.95 at 8:22 this morning. I'm still holding it with a 1.4R gain. I'll be keeping a close eye on AAPL Monday to see how it handles the 200-day moving average, which is just a few points away. So what was looking like a pretty blah week turned out to be pretty good thanks to my willingness to change my bias from long to short and take some swings. While I try to stick with trading the setups I find via the site, sometimes I just need to call some audibles, and trade based off of what the market is telling me to do via all the charts I track. That paid off this week.